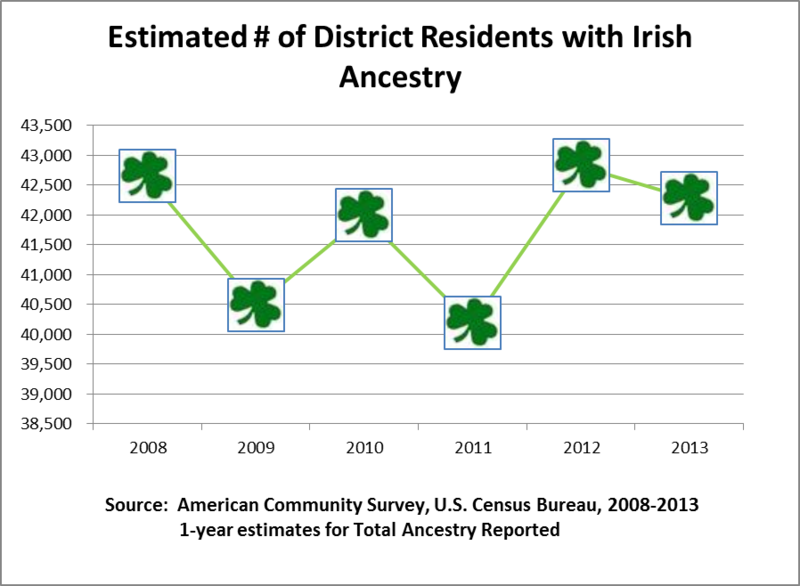 March is Irish-American history month (see the President’s proclamation here), and with St. Patrick’s Day upon us, we looked to the American Community Survey to see how many people in the District are estimated to have Irish ancestry. In 2013, the District was estimated to have 42,268, a figure which may include the most famous District resident with Irish ancestry, the President himself. The estimate has been fairly steady the last five years. Among the states, however, the District has the third lowest percentage of the population estimated to have Irish ancestry in 2013 at 6.5 percent. Only Utah and Hawaii have fewer (percentage of) Irish. What exactly is this data? We used the 1-year estimates of the U.S. Census Bureau, American Community Survey (ACS). Specifically, we looked at the variable “total ancestry reported”, which includes a tally of people with one or more ancestry categories reported. Although the ACS produces demographic estimates, it is the Census Bureau’s Population Estimates Program that produces and disseminates the official estimates of the population. < Previous D.C. high school graduation rates: how does your school compare? I thought the President maintained Illinois residency. How the President is counted in census data is an interesting question. The “Residence Rules” for the 2010 Census apply the concept of “usual residence” when filling out a Census form. The rules say “Usual residence is defined as the place where a person lives and sleeps most of the time. This place is not necessarily the same as the person’s voting residence or legal residence.” We are not certain what address the President wrote on his Census form, but the White House indicated that he listed the First Lady’s mother on the form. Since she lives with them at the White House, it seems likely that he put 1600 Pennsylvania Avenue as his residence for Census purposes. But none of this matters for the purposes of this annual ACS data, which is an estimate, and not a census – unless the White House was among those receiving a survey in a given year.